Here is a list of some frequently asked questions (some of the information is available elsewhere on the web site, but worth repeating here due to the frequency that the questions pop up). This page will be updated with more frequently asked questions, so it’s worth coming back here now and again to check! Some items have 7 – 10 days delivery – why? Some of my stock sells independently of the web site and even though I try to keep the stock levels as accurate as possible, it isn’t always possible to be 100% accurate. Some items will then have to be ordered direct from my suppliers and to avoid disappointed I advise that delivery can take up to 10 days. If you require anything faster, just let me know as usually there’s no problem getting items faster. Do I need to run my blade in? All blades will benefit from being run in, which basically means cutting at a reduced feed rate for the first 10 - 15 minutes of cutting. 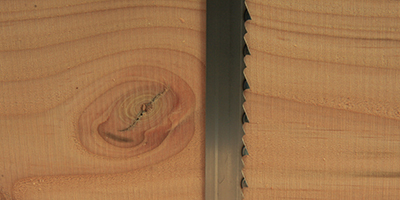 For most users cutting wood, running a blade in is not vital as for cutting metal. If you have a couple of hours cutting in store with a new blade, then reducing the feed rate for the first 10-15 minutes of cutting can help in improving blade life. 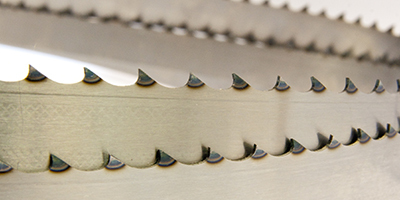 If you are cutting metal, then running the blade in is vital to get the most out of the blade. 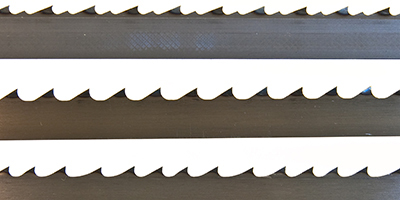 New blades are very sharp but for metal cutting a tooth with a slightly rounded edge will perform better and last longer, so it’s important that the first 15 minutes of cutting with a new blade is done at a reduced feed rate than normal. Do I have to take the tension off the blade, when the machine is not being used? Most manufacturers advise to always release the tension on the blade when not cutting, but in real life, day to day workshop use this is usually not a practical thing to do. Most bandsaw users want to just use the machine when something needs cutting and not have to re-tension the blade every time. 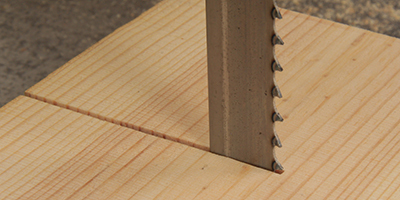 If you know that you won’t be using the bandsaw for a couple of weeks, then it’s a good idea to release the tension. If you are running an M42 blade, which requires more tension, then again your machine and blade will benefit from having the tension released but otherwise, there shouldn’t be any problems with keeping a SuperTuff Carbon, SuperTuff Premium or SuperTuff Fastcut on the machine for day to day use. Can I cut metal on my bandsaw? To cut metal on a bandsaw you need a blade with the correct amount of cutting teeth per inch and the correct cutting speed. 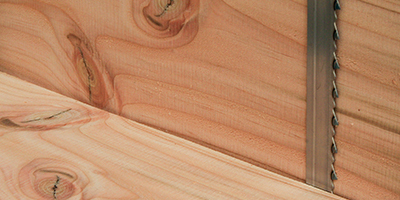 Most wood cutting bandsaws tend to have either a single cutting speed or two cutting speeds, obviously there are some exceptions, but on the whole, wood cutting bandsaws have limited choice when it comes to choosing the cutting speed. The cutting speed required for cutting metal depends on the type of metal being cut, but the average cutting speed for metal cutting is usually around a quarter if what a wood cutting bandsaw runs at. 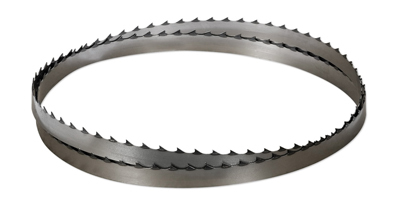 Non ferrous metals can be cut at a faster cutting speed and usually on two speed bandsaws, the slowest speed is sufficient for cutting non ferrous metal. 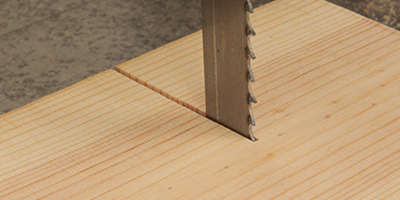 Even if the cutting speed on the bandsaw is a little higher than recommended, it is possible to cut small amounts of metal using an M42 blade and a slow feed rate. If you want to cut a lot of metal though, then you will be better off with a multi speed machine. If you use the wrong tooth pitch or if the cutting speed is too fast then the teeth on the blade can just strip off, leaving the blade useless. How do I know when the tension is correct? There are numerous theories and guides on achieving the correct tension and basically you adjust the tension enough so that the blade is not slipping on the wheels when cutting and the cut is straight. If there’s a bow in the stock being cut, then more tension should be added. 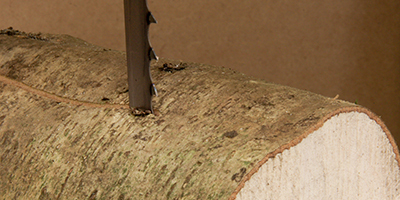 You may find that when cutting thicker stock, more tension will be required to keep the cut straight and true. Most machines will have a guide for tensioning depending on the width of the blade, but these are not very accurate and should only be used as a guide to get a rough idea of the amount of tension required. 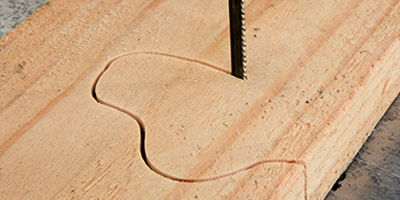 The more you use a bandsaw, the easier it is to tell when the tension is correct and the best way to tell is by how the blade is cutting as you get to know the sound of a blade slipping or not cutting correctly. 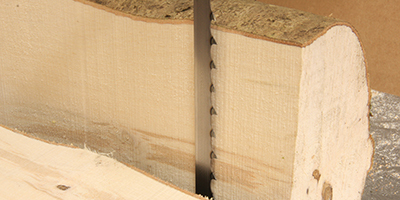 M42 blades require more tension than standard blades and as a rough guide they should be tensioned to the next width up on the bandsaw, so a 3/8” M42 should be tensioned to the same amount as a standard 1/2" blade and a 1/2" M42 to the same amount as a standard 5/8” blade. Can I use the same blade for radius and staight cutting? Ideally you should use seperate blades when radius and straight cutting. 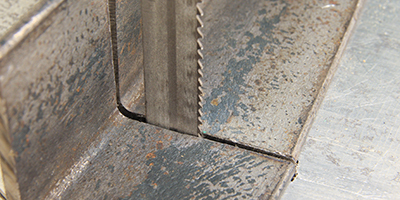 When radius cutting, one side of the teeth will wear faster than the other and this can then cause problems when you straight cutting as the blade will tend to wander. It's not always possible to use seperate blades so it's important to keep an eye out for blade wander when straight cutting with a blade that has been used for staight cutting.